Politics has become somewhat of a circus. It is so stuffy, boring, and inefficient. 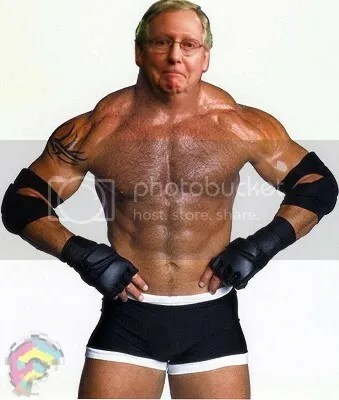 But what if each politician had to dress up as an old school WWF character (not the World Wildlife Foundation, the World Wrasslin’ Federation)? Not only would they have to dress up, but they would have to talk like all those crazy charactors like, JunkYard Dog, Hacksaw Jim Duggins, British Bulldog, Macho Man Randy Savage (R.I.P.) and Brutus the Barber Beefcake. I would not only watch the news, I would enjoy it. I would even get that channel that streams coverage from the House of Reps or Congress or whatever it is.